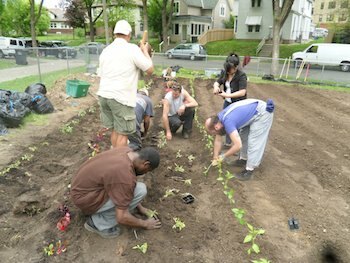 Project Sweetie Pie, a grassroots gardening organization in Minneapolis, Minn., has a simple objective: Grow luscious gardens in the city’s vacant lots to cultivate a strong community. Michael Chaney, Project Sweetie Pie organizer and community leader, and other community members (specifically members of Afro-Eco, a Minneapolis group that promotes social, economic, cultural, and ecologically sound cooperation) formed the organization to cultivate garden plots on unused lots scattered throughout North Minneapolis. Chaney said the organization supports the plots to help promote the growth of community agricultural businesses and a food corridor containing livable wage jobs. Project Sweetie Pie was founded in 2010 in response to the proposed closing of Minneapolis’ North Community High School. The Project idea was sparked during a conversation at an Afro-Eco board meeting. “We felt that the closing of a school was a killing of the heart of the community,” Chaney said. “Many families often center on their children. So, you take away that school, you take away a lot of the purpose for community.” To help keep the school open and show how important North High was to the community, Afro-Eco took on the Project and provided fiscal support. The Project started small. At first, the program only grew sweet potatoes in North High’s greenhouse as part of an after school program. “They had a greenroom there that had been fallow for about 10 years,” Chaney said. One of the new projects the organization is working on concerns the creation of an underground greenhouse. “One of the handicaps, if you will, to urban farming in this community, in particular, is (we get) a lot of attention, a lot of TLC, from May to September,” Chaney said. It’s difficult for the garden to maintain momentum throughout the year because there aren’t many outside, non-academic resources, such as commercial greenhouses, or any farming institutions, to fuel community support. While a lot of the Project’s produce is sold by community youth at local farmers’ markets, the organization also began a partnership with a local restaurant, Gandhi Mahal. “They have pulled together 16 gardening projects, and Project Sweetie Pie and our youth are working alongside them. The produce from that project is going to the restaurant,” Chaney said. Although the Project is best known for its superb sweet potatoes, the organization has started to grow other types of produce, such as tomatoes, onions, cabbage, lettuce, kale, pumpkins, and peppers, too. The organization continues to acquire different spaces through approaching vacant plot owners, and spaces that aren’t being used. And while the Project is still eager to take on additional vacant lots, Chaney said he and the other organizers are now trying to use the organization to help strengthen the community, increase physical activity and nutritional awareness in kids, and to help decrease urban decay and carbon emissions.